A nice easy 10k recovery type row. I thought I’d have a final go at the 2500m c2 challenge series today with a different pacing plan. Rather than sit on 1:40’s and speed up towards the end I decided to try a more pyramid style of pacing, holding the pace faster off the start and settling to 1:40’s a little later in the middle, before then pulling the pace back towards the end. So it kind of worked, except the final time was 0.5seconds slower than Friday. For some reason I thought I was a long way off when I came to about 600m to go so didn’t commit to pushing hard in the final 500m, despite the fact I was still about 0.8sec up at the 500m to go point on from Friday’s effort. Oh well, I wouldn’t have beaten it by more than a few tenths anyway. It’s all good 5k / 6k training to do consistent 2500m pieces a couple of seconds under the pace I want to do 5000m in a few months time. I’m keeping the weight training fairly simple, and fairly quick by keeping the weight the same for many of the exercises to begin with. 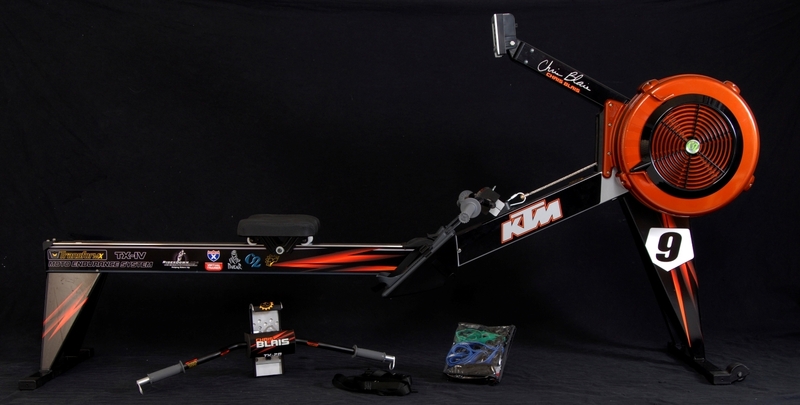 I’ll start off with a pimped erg, blog my training for today, and then finish off with another pimped erg with some explanation why I am posting the pictures. Today’s training was a second go at the concept2 challenge series which is 2500m for this month. I’ve had a bit of a cold for the past few days so took a rest day on Wednesday, an easy day yesterday, and then decided to just do this today but at a much more conservative pacing plan than I really think I can do. I did 5 hard strokes (peaking at 1:24), settled for 5 strokes, then from 100m in just pulled 1:40’s for the first 1000m. This felt good, I got to 1500m to go and could then just treat it like the last 1500m rep of an interval session. 1:39’s for 500, then 1:38’s for 500m, then looking to firstly beat DCs time (one of the guys I coach), and secondly get under 8:10. Both achieved with a strong finish, but I finished still pulling 1:29’s, and only really having just got into it. I find there are just two choices, attack hard or cruise. The 1:38’s steady that I tried to go at last time were an inbetween pace for me, not hard enough to be attacking, but not slow enough to cruise – does that make sense to anyone? I still think I should be able to go 2sec faster pace than this (and will need to now that Tim Male and others have submitted much faster times), but in order to do so I need to attack it at a higher rating from the start. At least I’ve got a time on the board now that I’m happy with, so if I do try again on Sunday I can afford to risk it a little more. 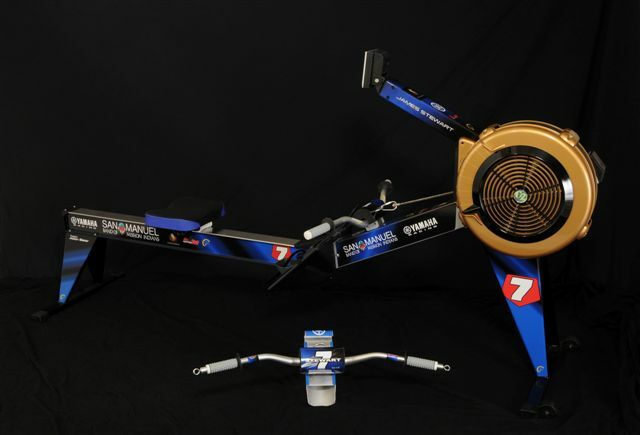 These ergs have been pimped by motocross riders in the US. It seems that erg training has become pretty big for US motocross riders in their physical training, and some of the riders have been training with the Pete Plan! More information will be posted there in the next few days about the event, so check back, and let me know if you’ll be making it along to compete or watch. I feel much better today than yesterday. On these longer rep 6k prep sessions I said I wanted to work them down to 1:40 pace. In order to judge how much work that will take I decided to go for the first rep at 1:40 today and judge from there. The final 1500m rep beat the pace of the single 2500m yesterday, so I am sure I can go faster on that. 1:41's feel good and a nice cuisey sort of pace for these reps at the moment, so I think I could probably do the 4 x 2k around 1:41 – 1:41.5 at the moment, and it's this session that I want to get back down sub 1:40 average. As I said in my blog yesterday, I needed to get a score on the board for this month’s C2 challenge series 2500m. As I didn’t have much time for training today I thought it was a good opportunity, despite not having slept well last night, or feeling too good today for some reason. I convinced myself that my plan of 1:38’s for 2000m then a fast last 500 was well within myself, as it’s 2sec slower than Boston cruise pace, and only a second or so faster than 5k pb pace (ok, I ommited the fact that I can’t do that at the moment from my mental discussion). Anyway…. It felt like a good cruise for the first 1000m. By half way though my belly was churning and I thought it was going to explode (any more details would be TMI). I thought about stopping and leaving it for another day, but Jo’s blogs of the past two days made me decide the better plan was to slow down and limp in rather than stop and have to start from scratch again. I’m not sure what’s up with my belly but I hope it’s gone tomorrow! A constant pace and rate throughout. As I said in a recent entry I am changing my focus for a while to the 5k and 6k, which will work well with my Farnborough 5k competition coming up in 13weeks time. My plan is to focus on that longer term goal of the sub 20mins for 6k (1:40 pace), with hopefully Farnborough being an intermediate point with a 5k around that pace. I will work through this rotation going faster and faster for each session as I do it again. Once per week I will do a longer interval session with 4 reps in the region of 5 to 7mins (1500 to 2k or so), working these down to 1:40 pace too. Every 2 weeks or so I plan to do a restricted 2k, either restricted by stroke rate, or by a certain pacing plan. This is something I want to do in order to get used to doing 2ks as a regular workout piece. Eventually I’d like to get back to what I used to be able to do, which was a sub 6:20 for 2k as a normal gym workout, with other work after it. Alternating with this I will do a 6000m piece slowly working the pace down from the piece I did last week. Between these tougher workouts I will do steady distance work of between 35 and 75mins (10k to HM), generally in the range 22-24spm, so around 1:50 to 1:52.5 pace, though occasionally I will push some of the distance pieces harder. The one other piece I will put in this week is a 2500m for the C2 challenge series. My aim for this is to row the majority of the first 2000m at 1:38.0 (after a fast few strokes to start), then push in the final 500m to try to end under 1:37.5 average. The 1:38 should be ok as it’s 2sec slower pace than my Boston cruise pace. The 5k / 6k training will then serve me well for the final round of the challenge series next month which I believe is a 16m19 piece. I want to get myself in a position on the 2500m where I have a chance of moving into 3rd overall in the final round. I’m playing catch up having had a very slow round in December when I was away a lot and ill, only being able to row a 1:47 pace for 5k. The target really was to do just under 1:40 for all reps, but once you get into the negative split pattern it’s hard to break it. The last rep was just a little push to prove to myself that there was plenty left before the next session in this sequence. As you can see from the link above this rotation will go through 12 x 500, 10 x 600, 8 x 750 and 6 x 1k all with 1min rest between. 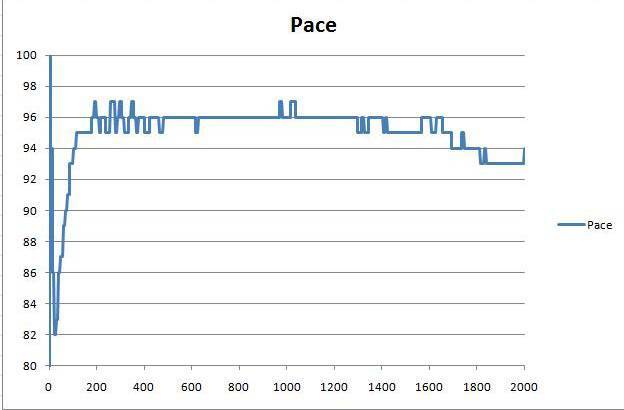 Pace will naturally drop slightly from session to session, then the cycle begins again back with this session. An enjoyable late morning session for a change to break the working day up, as I have been training more after work lately to use a different gym. I think it will be an important aspect of my training over the next few months while I’m targetting the 5 and 6k to start pushing these longer distances again. Once I get to really pushing the hour (ie under 1:46 pace), then 6k starts to seem really short. What better way to begin a phase of 6k training than with a 6k test to see where you’re starting from. I decided on a slightly sub maximal attempt, mainly to make sure I didn’t aim too fast. All reps were sub 1:40 pace, and this felt fairly comfortable, even after the 6k. It’s a good start on the interval work that will help me bring the 6k down towards 1:40 pace. During this phase of 6k training (leading up to the Farnborough 5k race on 22nd May) I will try to do regular 6k’s by using 1:45 as a base pace from the start like this, and pushing the pace down from further and further out. By training for, and doing regular 6k’s when it comes to racing a 5k it should seem nice and short. For my reference later really, a record of the links to the stroke data, splits data, and reply from my race in Boston.